MONDAY NIGHT ---- She's going HOME tomorrow!!!! Clickety-click-click right here!!!!! Our dear, sweet, irreplaceable Heather is having surgery this week. Brain surgery. It's scheduled to happen this Thursday at Mayo in Minnesota. She will be in ICU at least 24 hours and in recovery 3-5 days after. * It would be amazing if each of you would leave a comment, and commit to a specific time daily to cover Heather and her family in intercessory prayer; I know so many of you are already covering our sweet friend. * Surgery is this Thursday with recovery lasting about 6 days. How about we start covering her Wednesday at 8am CT and go forward for the coming week? If you could commit to a certain time every day to pray, we can ensure that we have at least one person praying at all times 24/7. * If everyone who signs up posts a quick prayer request on their blogs and links back to the specific post in Mr. Linky, Heather's family could see the tangible covering of prayer that is going forth on their behalf. This will also give us a chance to expand this out to everyone who reads your blogs as well. Think of the worship in heaven on Heathers behalf! I truly, deeply believe this would impact them in ways we cannot begin to comprehend. Where Two or More Are Gathered in His Name. Please come join us. ** Updated: To sign Mr. Linky and commit to a time ... click here! I've been trying to write this post now for a few minutes. The thing is, I'm in tears. The very thought of what is about to be asked of each and every one of you is so huge. So important. So critical. And, in my heart of hearts, deep in my soul, I know you are all going to want to jump all over this with both feet and that just makes me cry. Tomorrow, there will be an Intercessory Prayer Chain Mr. Linky put up on my blog. It will stay sticky (with some help from someone who can explain that part to me) through the coming week. We will also link to any updates that we may have from Mark or Laura. It would be amazing if each of you would leave a comment, and commit to a specific time daily to cover Heather and her family in intercessory prayer; I know so many of you are already covering our sweet friend. Surgery is this Thursday with recovery lasting about 6 days. How about we start covering her Wednesday at 8am CT and go forward for the coming week? If you could commit to a certain time every day to pray, we can ensure that we have at least one person praying at all times 24/7. If everyone who signs up posts a quick prayer request on their blogs and links back to the specific post in Mr. Linky, Heather's family could see the tangible covering of prayer that is going forth on their behalf. Play That Funky Music …. At first, I thought I'd post this ... but instead I'll leave you this Saturday night with a family favorite! You can click here .... and here ..... for updates on the to Dr. appts at Mayo today! My dear, sweet, precious friend Heather and her husband Mark leave tomorrow for the Mayo clinic for at least 7 days of evaluations regarding her brain tumor, which may also include Heather going under the knife. 1. The doctors - That God will guide them through whatever faces them. That they will be direct and honest, so Heather and Mark can fully understand every option available to them. 2. Heather - that God will continue to work His peace, and His grace in this terrifying situation. 3. Mark - Heather's precious husband, for strength, discernment, peace and rest. 4. Easton, Elijah and Emma Grace - that they will feel God's presence while their parents are away and they are in the care of others. Pray that their little hearts will be turned to God for the peace that passes all understanding. 5. Heather's parents - I think, though I'm not sure, that they are watching Heather's kids. Either way, pray that God carries them through this time when their child faces such tough circumstances. Greg, Heather's dad said something that touched me- "I gave you to God a long time ago ... ". May this bring peace that God in holding her in His Hands. 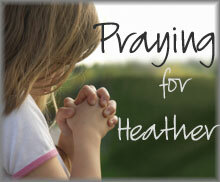 For more on Heather's situation, you can click here. Well, isn’t that just amazing! 1 Peter 5:7 (NIV) - Cast all your anxiety on him because he cares for you. Today has been a day of renewal in the house. We expected things to take some time to become clear. But God, in His infinite love and grace let us off the hook on one matter today. This particular issue has given us enough sleepless nights, caused many long drives for John and I to talk things through. It's been brewing around for weeks and frankly, had tired us both out. Last night we held a family meeting. We do that alot in our house to discuss decisions, events, touch base in each others lives. Although we make some unilateral decisions on the more necassary things, we firmly believe that our kids are old enough to be a part of certain family-affecting issues. So, last night was the night to bring them on board. We sat them down and explained the situation. The possible outcomes, the decision we wer trying to make. Then, John prayed. We simply said open the doors clearly or close them firmly. By noon today, the doors has opened on one side, and the other had closed. Both as clear as the day is long. God is good that way. Amazing, actually. The best part ? ... was watching the kids faces as they understood God's clear and present purpose in the decisions. They saw first hand that God does speak to us, at times, this <u>flat-out</u> clearly.